Remember that Valentine’s Day in 3rd grade when you asked your elementary crush to “be mine,” only to find out that he or she had already been serenaded with by Kelly McCall or Jimmy Fouts with $0.25 construction paper, some old doilies, and a box of the same hard candies masquerading in your own mess of pink, red, and Elmer’s Glue? Well, apparently, your car doesn’t. According to a survey of U.S. drivers, 75 percent of Americans have a love affair with their cars, which may explain why it’s so hard for honey to send that ’90 Datsun pickup with 277,000 miles and a completely rotted interior to the big parking lot in the sky. But you may not have to surrender to an oil-slicked driveway or “that 70′s smell” just yet. 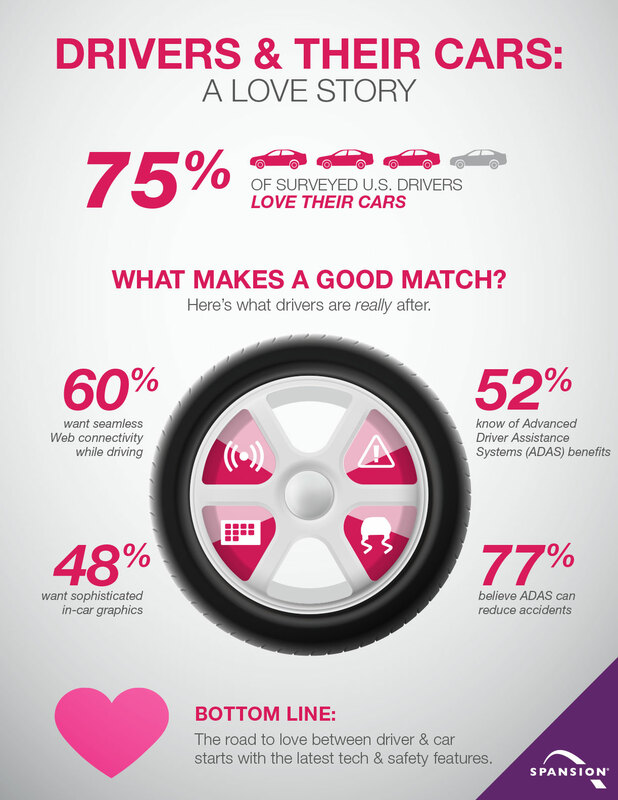 As this infographic from Spansion shows (www.spansion.com), more drivers than you might think are educated about modern car technologies such as active safety systems and IVI. So without further ado, I present you with “Drivers & their cars: A love story.” I hope you enjoy this more than whatever roco you get stuck watching this weekend. Happy Valentine’s Day.